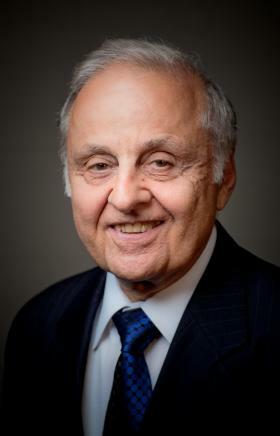 Joseph E. Berberich is the most senior member of the firm. He joined the firm in 1969, and has been practicing law for over 40 years. At one time he, DeWitt Manning, George Leaver, and Walter Bruder were all partners, and thus the name of the firm, Manning, Leaver, Bruder & Berberich. Throughout his years of practice, Mr. Berberich has been engaged in all areas of the firm’s practice. In addition to being counsel for many California new car dealers, Mr.Berberich is counsel for the California New Car Dealers Association (CNCDA) and affiliated entities, the Greater Los Angeles New Car Dealers Association, the Southern California Chevrolet Dealers Association, and the Southern California Chevrolet Dealers Local Marketing Association. Mr. Berberich has, for over 35 years, had an AV (highest possible) peer review rating in the well-known and highly regarded Martindale-Hubbell legal directory, which means that his peers have spoken and accorded him with the highest rating standard, signifying the greatest level of professional excellence for legal knowledge, communication skills and ethical standards. Mr. Berberich was one of the originators and current editor of the California New Car Dealers Association Dealer Management Guide, an over 600 page book which is revised frequently, published by the Association and distributed to its members, and which covers a multitude of legal topics affecting dealers. He is also the author of the California Auto Dealer Advertising Law Manual and co-author of the Callifornia Auto Dealer Finance and Insurance Compliance Manual. He has presented many seminars on advertising law to California automobile dealers. Mr. Berberich is well known throughout California for his expertise in representing buyers and sellers of automobile dealerships and has handled a large number of those transactions during his career. He focuses his practice in the areas of general civil law, automobile dealer law, business purchases and sales, association and commercial law, real estate sales and leases, probate and estates, and business law. Mr. Berberich is the father of four sons, and he is proud to say that he survived a period of time when all four of them were under age four (there was one set of twins). He is a member of the Los Angeles County Bar Association and the National Association of Dealer Counsel (NADC), and has been involved in various civic, community, and charitable organizations. He is a director of The Fred and June MacMurray Foundation, a private charitable foundation, and an advisor to and supporter of The National Veterans Foundation, a crisis hotline support for veterans. ...take or threaten to take any adverse action against a dealer pursuant to an export or sale-for-resale prohibition because the dealer sold or leased a vehicle to a customer who either exported the vehicle to a foreign country or resold the vehicle in violation of the prohibition, unless the export or sale-for-resale prohibition policy was provided to the dealer in writing prior to the sale or lease, and the dealer knew or reasonably should have known of the customer's intent to export or resell the vehicle in violation of the prohibition at the time of sale or lease. If the dealer causes the vehicle to be registered in this or any other state, and collects or causes to be collected any applicable sales or use tax due to this state, a rebuttable presumption is established that the dealer did not have reason to know of the customer's intent to export or resell the vehicle. This is an article by Joseph E. Berberich which discusses representations and warranties typically made in an automobile dealership buy-sell agreement. This is an article by Joseph E. Berberich concerning the importance of knowing about factory plans or possible other points in a dealership’s geographic region. This is an article by Joseph E. Berberich concerning the way in which COBRA insurance factors into buy-sell agreements. 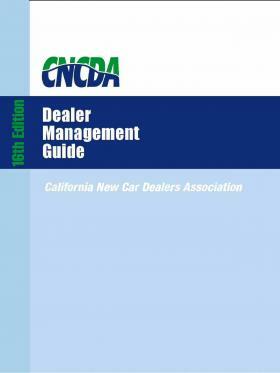 We are the authors of The New Motor Vehicle Board and Dealer Franchise Laws publication which is on the California New Car Dealers Association website. 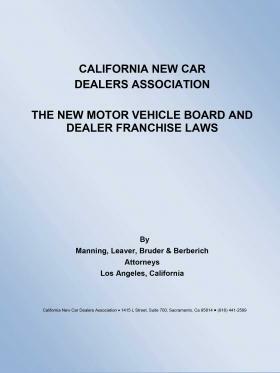 This publication covers the workings of the California New Motor Vehicle Board and dealer franchise laws. The New Motor Vehcile Board is an admistrative forum where dealers can enforce their rights in various area, particularly in dealership termination proceedings and the adding or relocating by manufacturers of dealerships in a dealer's market area. The publication also discusses many of the dealer rights franchise laws. See the link below to view a detailed table of contents for this publication. 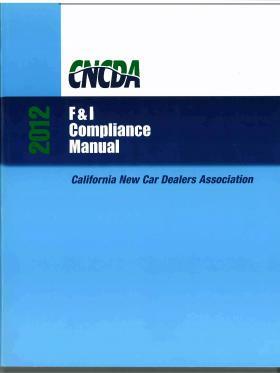 We have authored the widely used California Auto Dealer Finance and Insurance Compliance Manual. The manual was extensively updated in 2012 and now includes The Reynolds and Reynolds Law California F & I libary of forms with detailed explanations of how to use them. The manual is divided into five sections, Intake and Credit Processing, Deal Negotiation, Deal Documentation, Post-Contract Issues, and F & I Policy Considerations. This publication is a valuable tool in training F & I personnel and in complying with the numerous intricacies of California law in the vehicle sale and leasing process.